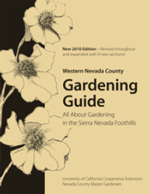 The 2010 edition of the Western Nevada County Gardening Guide is available in many of our local nurseries, bookstores, and hardware stores. It can also be purchased directly from the Master Gardeners at one of our workshops, events, or the UCCE Nevada County office. The 2010 edition was compiled and edited by 21 local Master Gardeners and features gardening in the Sierra Nevada foothills. Local citizens contributed their ideas over the years when they responded to questionnaires about what they would like to see in the guide. The 2010 Garden Guide features nine new sections and five sections were carefully reviewed and updated. After many requests, an index with over 900 entries was added. User-friendly formatting and more illustrations add to the ease of reading. The back cover includes an easy reference to the Master Gardener services.